Adrian Allinson, the eldest son of a doctor who had been struck off the Medical Register for his over-vigorous promotion of vegetarianism and contraception, was born in 1890. His mother, a German Jew, had studied portrait painting in Berlin. According to David Boyd Haycock, Allinson was expelled from Wycliffe College, because of his atheism. Allinson began his medical studies but soon transferred to the Slade School of Fine Art. Allinson made friends with a group of very talented students. This included C.R.W. Nevinson, Stanley Spencer, John S. Currie, Mark Gertler, Maxwell Gordon Lightfoot, Edward Wadsworth and Rudolph Ihlee. This group became known as the Coster Gang. According to David Boyd Haycock this was "because they mostly wore black jerseys, scarlet mufflers and black caps or hats like the costermongers who sold fruit and vegetables from carts in the street". Nevinson argued in his autobiography, Paint and Prejudice (1937) commented that the Slade "was full with a crowd of men such as I have never seen before or since." Adrian Allinson remarked how the naked female models at the Slade School of Fine Art with their wandering glances "seemed to share dark and unholy secrets" with the young artists. C.R.W. Nevinson, John S. Currie Maxwell Gordon Lightfoot and Edward Wadsworth all began relationships with models. The author of A Crisis of Brilliance (2009) has argued: "Allinson, still a virgin at twenty-two, was fed up at being unable to join Nevinson and Wadsworth in their comparisons of libidinous adventures. He used the new-found wealth from his Slade scholarship to procure one of the prostitutes who promenaded outside the Alhambra Theatre. He caught a venereal infection, but the escapade impressed his companions." After graduation in 1910, he continued his studies in Munich and Paris. In February 1911, Allison exhibited with C.R.W. Nevinson, Mark Gertler, Maxwell Gordon Lightfoot, Vanessa Bell, Duncan Grant and Rudolph Ihlee at the Alpine Club Gallery in Mill Street, Mayfair. He then joined forces with Augustus John, Percy Wyndham Lewis, Walter Bayes, Walter Sickert, Harold Gilman, Henry Lamb, Spencer Gore, Lucien Pissarro, James Manson, Robert Bevan and Charles Ginner to form the Camden Town Group. In July 1912, John S. Currie, Dora Henry and Mark Gertler went on holiday to Ostend. They had a good time but Gertler showed concern about Currie's behavior. He suggested that Currie's love of the writings of Friedrich Nietzsche had left him immoral. Allinson pointed out that Currie was insanely jealous of Dolly: "Violent jealously continually drove Currie to threats of murder... Dolly's beauty, and pity for her lot, aroused in more than one painter the desire to replace the Irishman, so that Currie's jealousy, originally groundless, in time created the conditions for its own justification." In 1913 Allison and several members of the Camden Town Group joined forces with the Vorticists to form the London Group. This included Edward Wadsworth, David Bomberg, C.R.W. Nevinson, Henri Gaudier-Brzeska, William Roberts, Alvin Langdon Coburn, Malcolm Arbuthnot, Lawrence Atkinson, Frederick Etchells, Cuthbert Hamilton, Jessica Dismorr, Helen Saunders and Dorothy Shakespear.He was also a member of the the New English Art Club. On 8th October 1914, John S. Currie murdered Dolly Henry. The Times reported the following day. "A young woman, whose name is said to be Dorothy or Eileen Henry, was found fatally shot in a house in Chelsea... At a quarter to eight yesterday morning shots and screams were heard. The other occupants of the house ran upstairs and found the woman on the landing in her nightdress bleeding from wounds. In the bedroom a man partly dressed was discovered with wounds in the chest. He was taken to Chelsea infirmary, but the woman died before the arrival of a doctor." Currie died three days later. His final words were: "It was all so ugly". Adrian Allinson was a pacifist and during the First World War associated with members of the Bloomsbury Group such as Mark Gertle, Vanessa Bell, Clive Bell, Leonard Woolf, Lytton Strachey, David Garnett, and Duncan Grant. During the war he produced drawings for The Daily Express. 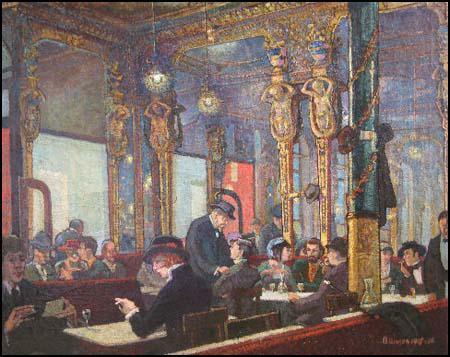 He also produced one of his most important paintings, The Café Royal (1916). After the war Allinson travelled widely, painting landscapes and still life subjects in Italy, Switzerland, Greece, Majorca, Ibiza and Spain. He became a member of the Royal Society of British Artists in 1933 and of the Royal Institute of Oil Painters in 1936. In the 1930s he designed posters for the London Underground. This included Windsor Castle (1934), Hampton Court (1934), St Peter's Church (1937) and Wooton Church (1940). Allinson also worked for the Empire Marketing Board. During the Second World War, Allinson was selected as a government war artist by the War Artists Advisory Committee (WAAC) and his contribution to the Dig For Victory home front food campaign in his picture: The AFS Dig For Victory in St James’s Square (1942). After the war, Allinson taught at the City of Westminster College, exhibited at the Royal Academy and designed sets for the Beecham Opera Company. Adrian Allinson died in 1959.